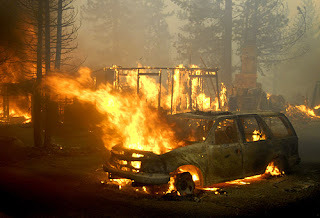 Wind-whipped wildfire broke out Sunday afternoon just outside of South Lake Tahoe, with at least 165 homes and other structures were destroyed and had burned 2,000 acres of heavily wooded, parched terrain just west and south of it. The unincorporated area is between U.S. Highway 50 and the popular Fallen Leaf Lake below the slopes of Mount Tallac. 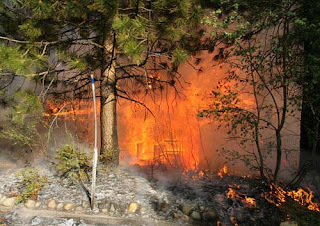 Officials said about 1,000 people were evacuated from communities near the fire. 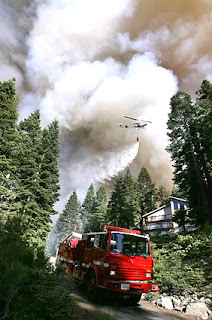 Some residents went to two evacuation centers in South Lake Tahoe, while others went to the homes of friends and the many hotels in the area. No injuries were reported.